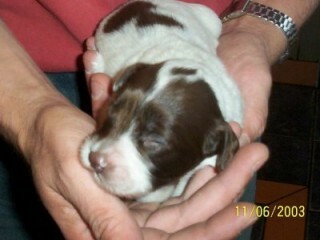 This sweet little puppy is called ‘Kara’, and here she is just 12 days old. 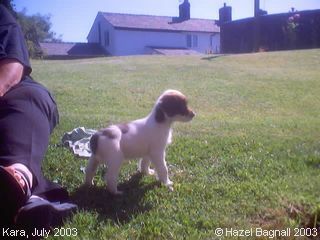 But look what a lovely glossy coat she already has! 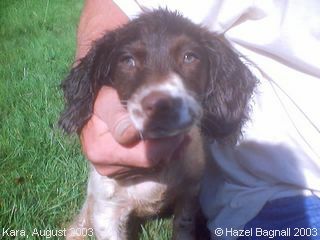 This Image is reproduced with kind permission of her breeders, Brian and Sandra Courtman. 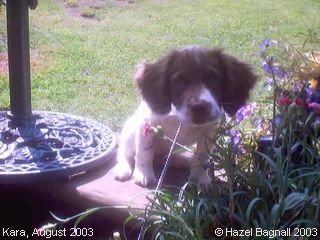 Other gun-dog puppies are available from time to time from their Kennels in Loughborough, Leicestershire. There are more photographs of Kara below. It looks as though Kara really enjoys the outdoors! More glorious weather on this photograph, which was taken on 15th August 2003! It's been really difficult with so many endearing photographs of Kara to choose from for this web page, which they should be, but finally, who could resist this one?! Taken on Bank Holiday week, 27th August 2003.